Twitter Benchmarketing: What it is? Benchmarking on Twitter will be decisive for establishing a successful strategy on this channel. If your brand or company is not using Twitter but your competitors are, then you can’t ignore this platform. At the very least, you should reconsider adding it to your strategy. You can learn a lot from your competitors and their strategy on Twitter: What they are doing well and what not, which followers you have in common and where to find common ground. However, the main reason to analyze your competitors on Twitter or any other social networks could be to avoid losing track of your own strategy. Competition will keep you alert and will encourage you to keep moving, preventing your plans from getting stuck. Sometimes, a plan changes for the better. Benchmarking is a comparative against a standard. It’s key to evaluating and analyzing competitiveness in all areas: Development of new businesses, assessment of new ideas or social networks, including of course, Twitter. In short, benchmarking means performing a thorough analysis of your competitors, through data collection and interpretation, to make the right decisions. You’ll get a clear image of what’s happening around you to let you create a successful strategy for your Twitter account. Successful Benchmarking on Twitter should start by identifying your direct and indirect competitors. Direct competitors: Those brands, businesses or companies that sell essentially the same product or offer the same type of services. For example, T-Mobile and Verizon. Indirect competitors: Those brands that don’t sell or offer the same product or service but that could satisfy the same needs. They target the same type of client. Apple or Skype could be indirect competitors to T-Mobile or Verizon. So, are you sure that you identified all your competitors? Have one last look, you might find other brands that you are interested in following closely for your benchmarking on Twitter. ✅ Search the best positioned brands on Google. Start asking about those key words that define what you do. : “Shoe shop in Denver”, “new business consulting services”, “social media tool”, whatever you do, write it on Google’s search box and start analyzing the first results. Exclude those that are not competitors or don’t have a Twitter account. Select 2 or 3 for a more comprehensive analysis. 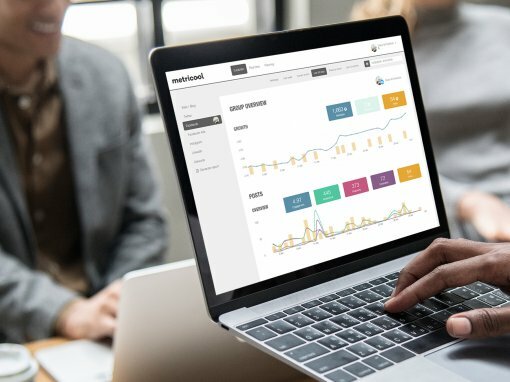 If you want to carry out professional benchmarking on Twitter, keep reading till the end: Metricool can offer you a tool that will make a competitor analysis easier. 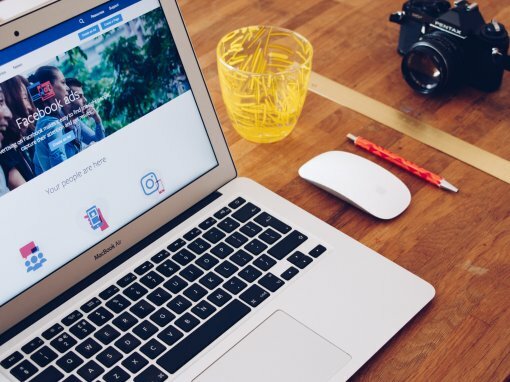 ✅ Research hashtags on Twitter: Track any related hashtag to your brand and look into it, you’ll certainly find either other brands similar to yours or direct and indirect competitors. ✅ Listen to your followers: You can obtain more valuable information from your followers than you think. Observe, listen and find out which other similar brands they follow. 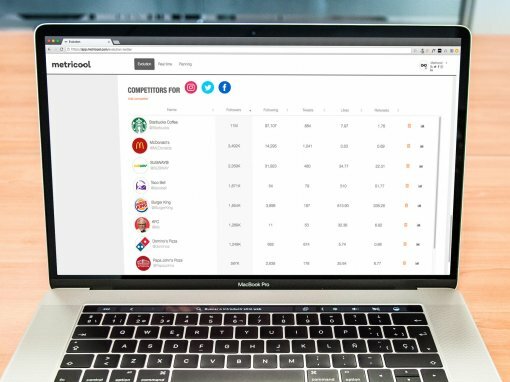 ✅ Your competitors are also investigating their competitors: Another technique to find new competitors, is to learn which other companies your competitors are considering, one’s that you didn’t know about. Once you finalize your study you’ll probably have gathered a complete list of direct and indirect competitors. Create an Excel file with this information so you won’t forget any of them. You never know when you’ll need to refer to this list. ❤️ Competitor’s Twitter account evolution: Learn how fast your competitors are progressing on Twitter. Note down whether they have a positive evolution or not and how their growth curve looks over time. 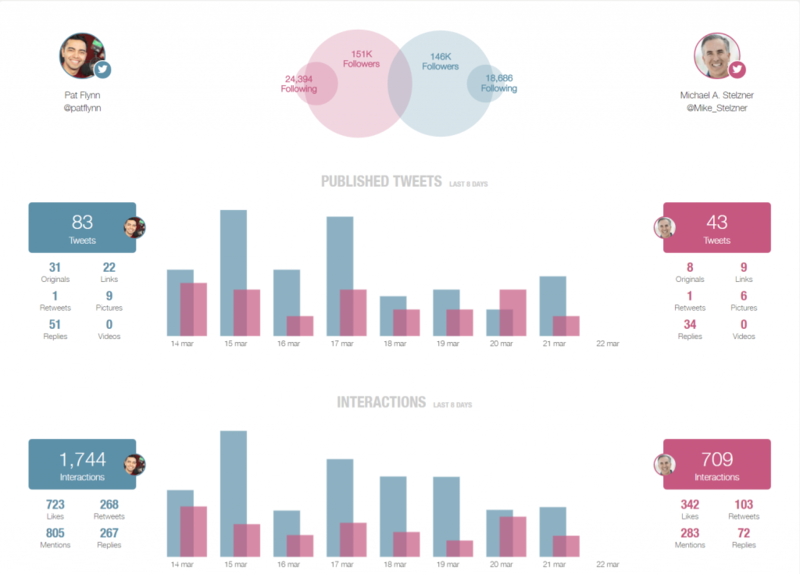 ❤️ Publication frequency: Determine how many times and how often your competitors tweet. Also, study which publications get the best results.With this information, you could discover a common pattern: you’ll find out which publications have a better result and why. ❤️ User interactions: Retweets, mentions, likes, replies, tweets referring to the brand. Knowing your competitor’s audience engagement is also a key factor. Performing this study manually would be impossible so Metricool offers you a tool to do it in an automated way, we just need the data. ❤️ Fans devotion level: Measuring love is not an easy task but we can get some clues to find out how loved your competitors are. 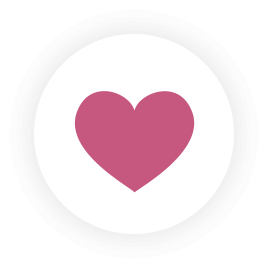 Positive comments against negative ones, number of interactions, comments from other users, etc., will help you calculate the “love” levels. ❤️ Response to their followers: Do they use Twitter as a customer service channel? Do they answer their followers? These are also important points to take into account about your competitors. We will let you do the competitor analysis, as nobody better than you can determine who is a competitor and who is not. However, now is our turn to help you out with the rest, making your life a bit easier. ✅ Click on Real Time: In the menu on the left you can click on Twitter to get access to the analytics in real time. ✅ Add your competitor: From the list that you put together from your benchmarking, start adding your competitors. You will access a very comprehensive analysis. Venn Diagram: where you can see how many followers and how many people are following both accounts and check the interactions between both circles. Published tweets analysis: You will be able to check the frequency, amount and type of publications in a comparative way. Type of tweets: Original tweets, retweets, replies, tweets with links, images or videos. Interactions analysis: you will see the amount and frequency of interactions and also, the number of likes, retweets, mentions and replies for both accounts. 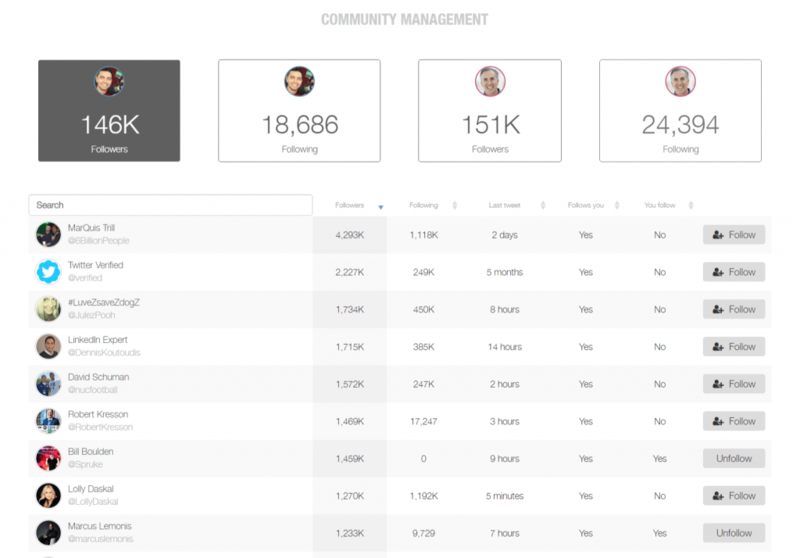 Community management: Select a group of users (followers or those followed, from one account or the other) and check who has more followers, or was recently active or doesn’t have any activity at all. That will help you determine whether to keep following them. ✅ Keep analyzing your competitors: to obtain data from other competitors you must refresh the page and start again. Just Introduce the new competitor to get their information. Data from the last 8 days: The competitive analysis is performed in real time, but you will also get the data from the last 8 days. This allows you to track your competitors week by week and check if they are consistent with their strategy. So, you’ve learned how Metricool can help you carry out a competitive analysis or benchmark on Twitter in a professional way and with real data. You will save a lot of time and your measures will be more accurate. The moment of truth has arrived. After all the exhaustive analysis about your competitors and data gathering, now it’s the moment to make decisions. The objective of any benchmark, either on Twitter or in any other business area, is making changes to improve. Do you have common followers? Which ones are they? Which are not? Which strategy do they use to follow other people? Do these people follow them back? How many tweets do they write? Do they publish original tweets or just reply to other tweets? Do they publish with links or images? Do they receive likes or retweets on their publications? More, or less than our own brand? How many people mention them? Who are they? Is it always the same people that write often about them or many of them that only tweet once or twice? ➡️ Be inspired by their best publications: If it works for them it might work for you too. Be inspired, don’t copy. ➡️ Define new strategies: Find new ways to improve your presence on Twitter with all the data you’ve collected. ➡️ Keep tracking: Although you are different from your competitors, you must consider them to keep growing and stand out. Bring your scientific side to light. Don’t rush to any conclusion without having time to develop a real hypothesis. Use logic, like Mr. Spock. Gather data without making assumptions. Thinking that you do everything right and there is no room for improvement can be your worst enemy. If you really want to listen, be objective and methodical, then avoid egocentricity. You are creative and you’re used to living with your own chaotic order. It might work, but when it comes to this type of analysis you must be methodical. Have all the relevant information in the same place. An Excel file will be your best ally. Find the Achilles’ heel of your competitors. Figure out what they don’t do well. You can always find out in first person by buying their product or getting some information about their services. Become a mystery shopper on Twitter. Your competitors’ weaknesses are an opportunity to improve your own business. Once you understand your competitor’s weakness, learn from their vulnerabilities and apply the gained knowledge to your brand. In general, it looks like there is nothing new on Twitter: shared informative tweets, interactions with followers, GIFs, images… the typical content. But don’t assume this all there is, and keep an eye on atypical and original ad campaigns. One brand is sharing coordinates on their profile, another one is making a teaser campaign about their new product. Keep track. Sometimes being different works and it’s worth our attention. Don’t underestimate that competitor from your list that seems harmless. What is important here is their growth not their size. There is no little enemy. Have you ever tried to sleep through the night with a mosquito in your room? Using only your follower’s opinion is not enough. Open your mind and listen to the people that are talking about you despite not being your followers. A competitive analysis is essential but don’t lose your creativeness, your brand language and tone. Be different! A good competitive analysis on Twitter doesn’t guarantee a successful new strategy. Benchmarking is the most efficient way to obtain all the information about your competitors and set you on the right path to establish a winning strategy. 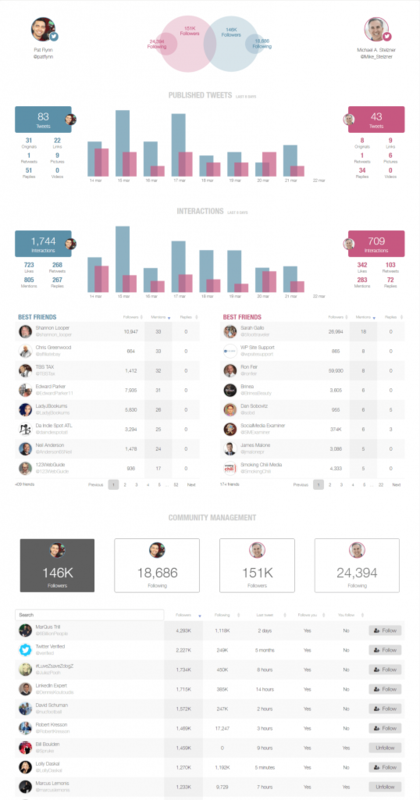 Now is your turn to start benchmarking on Twitter. You know that Metricool will help you out. Do you have another tip to add to the list? We are listening.